Edge of the Bay Appliance Maryland. Get the Job Done Right! 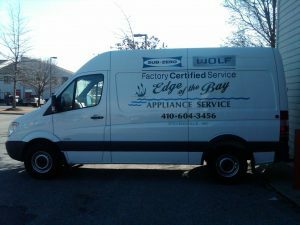 Edge of the Bay Appliance Service is recognized as a Factory Certified Service Provider of Sub Zero and Wolf products. As a Factory Certified Service Provider we maintain an extensive inventory of parts, which allows us a high percentage of completions for most repairs in the first visit. If we don’t have the part in our inventory, we can get it from the distributor within a day, providing the part is available. We offer same business day or next business day Sub Zero refrigerator or freezer service if you are experiencing a no-cool or no-freeze issue. Cleaning the condenser on the refrigerator to avoid a costly repair in the future. Checking the oven temperature so that cooking doesn’t become a guessing game. And Edge Of The Bay values your time! We realize that lifestyles and schedules have changed from the past when people were available to be home; today’s pace of life is much different. We continue to change the way we work with our customers when scheduling to make our visit as convenient as possible. Check out some Appliance Energy Tips! Simply complete our form below to submit an appliance service request.